Cockatoos are loud birds, and there's nothing you can do to permanently quiet them; communicating is simply in their nature. If yours is squawking and screaming up a storm at night, though, it can make getting your beauty rest next to impossible. 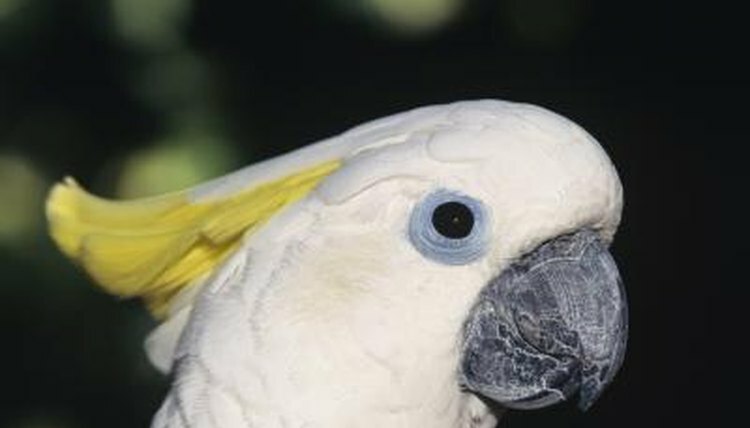 Working with your cockatoo both during the day and at night to identify and treat the cause of his loud behavior is the only way to break his bad, noisy habit. While some birds don't mind being left to their own devices, the cockatoo isn't one of them. This is a bird that loves attention, and the hustle and bustle of an active household. Even when he's in his cage, a cockatoo yearns to be near the action, not in a quiet, isolated room. Giving your cockatoo adequate attention during the day helps him stay calm, both during your waking hours and after it's time for bed. Neglecting your cockatoo's need for attention is a sure way to make him extra vocal at night. Your cockatoo's environment may be stressing him out at night, so experiment with different ways of changing up the room. For example, some birds become stressed out and vocal when a room is too dark, while others get nervous when a room has too much light. Placing your cockatoo near a window with open blinds may frighten him when car headlights go by, or when he hears street noise. No two birds are perfectly alike, so try adjusting your cockatoo's nighttime environment to see if his behavior improves. Cockatoos are smart birds, and they're capable of entertaining themselves when need be. If yours doesn't have anything in his cage to keep himself occupied, though, he can get stir-crazy—imagine being locked up in an empty room. Make sure that you give him toys and bird-approved branches and twigs to interact with. Cockatoos have big beaks that they love to use for chewing and shredding, so giving him something to wrap his beak around can stave off the boredom that leads to nighttime vocalization. If your cockatoo won't keep quiet at night, a trip to the veterinarian rules out any medical problems that could be an indirect cause. Infections, dietary deficiencies and even dry skin can irritate a bird and make him act out, simply because he feels uncomfortable. If your cockatoo won't keep quiet at night, and is constantly crying out, thrashing in his cage or picking at himself, take him in for a checkup to make sure that the problem is strictly behavioral, and not physical.